Will Robots Build my Product? Manufacturing products using assembly line automation has been of interest for a few decades. 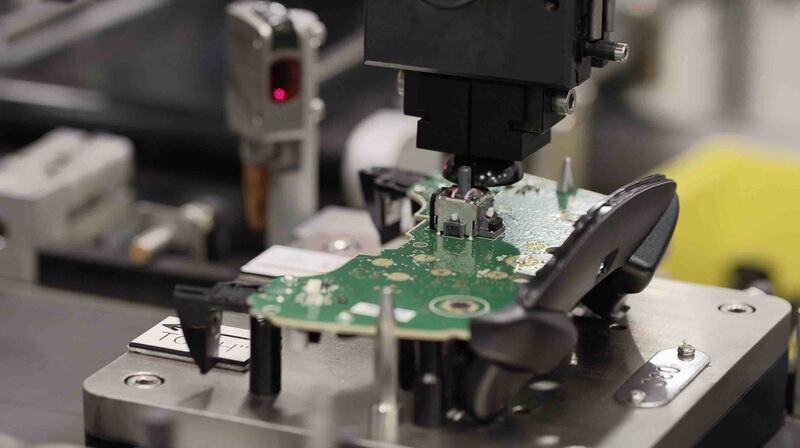 However, efforts to design automated assembly methods for consumer electronics fell by the wayside with the emergence of low-cost factories in the 1990’s. Now, interest in automated assembly has skyrocketed due to ever-increasing labor rates and a shortage of workers. 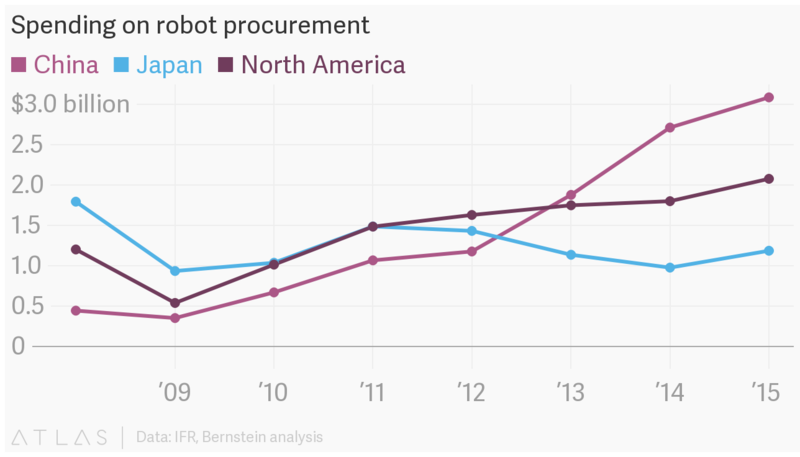 As the chart below shows, annual spending on robot procurement in China is now surpassing $3B. Also, industrial robots are the highest growth rate product made in China. What is the impact of this growth in factory automation? The big change is that a smart, very flexible worker is replaced with a much less flexible mechanical device not capable of making decisions or adapting. Humans have a fantastic set of senses including stereo vision, sophisticated touch, and hearing. Starting at birth, we all readily learn to process sensory information to aid decision making and action. What does this mean in a factory? It means that a person assembling a product can adapt instantly and adjust what they are doing—like seeing or feeling that a part isn’t going together correctly, backing off slightly, and changing the angle of approach (or wiggling the part ever so slightly) in order to achieve success. Or, in a more extreme case, a human worker can rapidly assess the situation, make the decision to stop trying to force parts together, and seek corrective action. Automated assembly methods such as robots and hard-tooled systems are not as capable as humans. They can’t readily adapt or make intelligent decisions. Automated assembly methods such as robots and hard-tooled systems are not as capable as humans. They can’t readily adapt or make intelligent decisions. The result is that slight variations in components and materials on the production line can disrupt machines performing automated assembly. These machines were setup to expect very consistent parts that assemble easily. Some inconsistencies can be predicted and accounted for ahead of time, but it’s the unpredictable or uncontrolled variations that create problems. In the extreme case, a robot attempts to assemble a product but instead damages components by trying to force them together. The importance of taking the assembly method into consideration in the product’s design cannot be over emphasized. To assure manufacturing success, a product that will be assembled by even the most precise mechanical device must have different design considerations than a product to be assembled by hand. Ideally, the capabilities and constraints of the assembly machines are known early in the product development process in order to design manufacturable products. An assembly process flow chart is recommended in order to capture the details of each assembly and test step. Key areas to identify for each step are whether the step will be automated or manual, the type of automation, the machine capabilities, and whether vision assist will be used. Pertinent machine capabilities include the number of axes of movement, positioning resolution, and target gripper type. Vision assist is often needed in order to accurately determine the position of components so that an assembly step can be performed. But, vision requires additional programming effort, capital cost, and cycle time. Adding vision later can be a difficult challenge, so early identification of the need is always best. Once the assembly process is mapped out, the product design can be made compatible with the process. If possible the product should be designed to be self-fixturing, which means a base part is used and other parts stack on top of it. Key design considerations include integrating electronic components rather than modularizing with connector interfaces, minimizing the number of fasteners, optimizing parts for symmetry or non-symmetry, determining how cosmetic parts will be safely grasped, and adding tapered lead-in features to guide parts in place. Component tolerances have to be completely understood to ensure the automation system can perform the assembly. Beware of components on circuit boards, such as connectors, whose placement may not be tightly controlled in the board factory. Humans can readily deal with a slightly wandering connector when they plug a cable into it, but the automation may not be able to. And keep in mind there are things robots really can't do, like open a bag of loose parts, dump them out, and ready them for use. Additional considerations include minimizing the total assembly steps as well as travel time of the automated machine. Design-for-automation requires planning, research and decisions earlier in the product development process. Is all this effort worth it? Yes! Design-for-automation requires planning, research and decisions earlier in the product development process. Is all this effort worth it? Yes! Keeping in mind that the amount of benefit tends to scale with the production volume and other factors, the result will be higher factory throughput and fewer defects. An additional benefit of an integrated design is higher field reliability. Finally, if a product is designed for automated assembly from the outset, it is highly likely to be easier for humans to build too. That may be beneficial at some point in the product life cycle such as an early prototype build, before the factory automation is implemented.